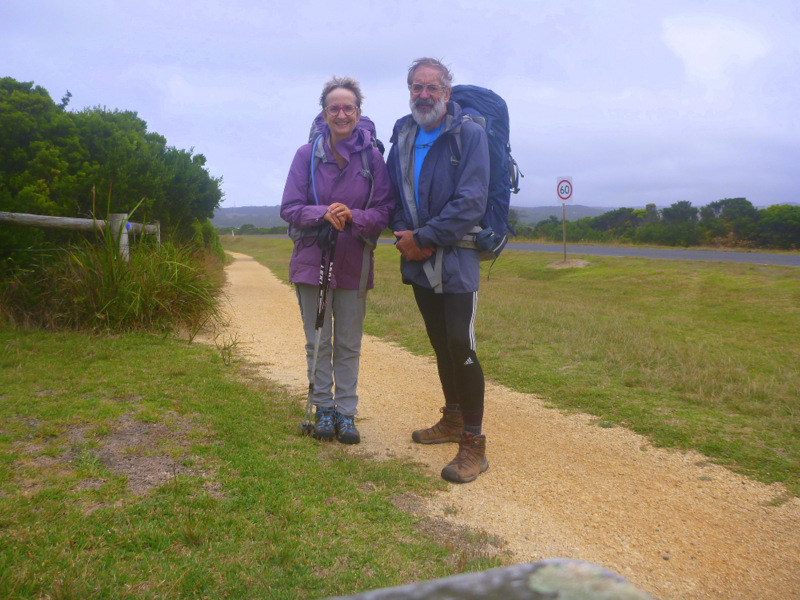 We chose to walk this path independently for the full 8 days that is recommended by Parks Victoria, carrying camping gear and food for the whole time. It is also possible to do the walk in a shorter time, by slack-packing with vehicle support or split over several trips. 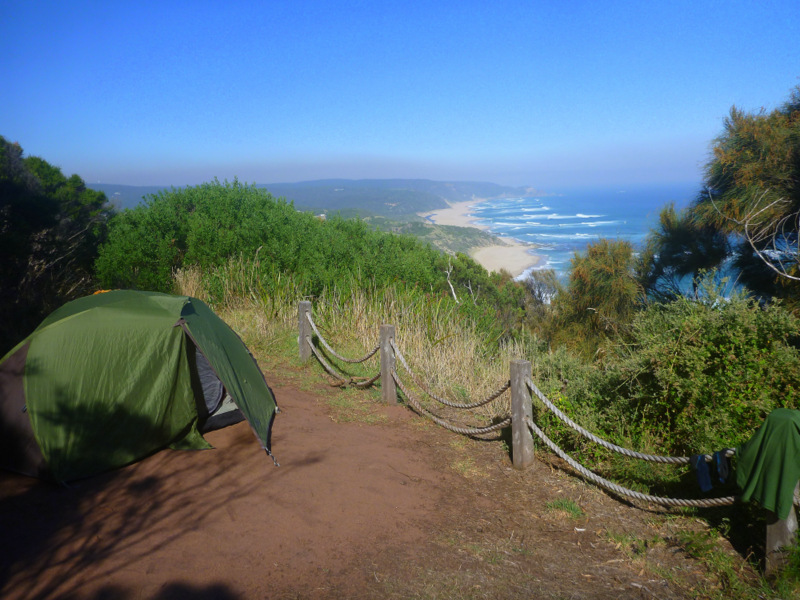 Camp sites are required to be pre-booked and paid for through http://www.greatoceanwalk.com.au while the guide book with maps we obtained with a phone call to Parks on 131963. We arrived in Apollo Bay on the V line bus in time for lunch at a bakery where the gourmet pies were beckoning. Scallop mornay went down very well. We bought some final food and alcohol for dinner and breakfast, and headed around to the recreation reserve and a campsite as all their cabins were full. 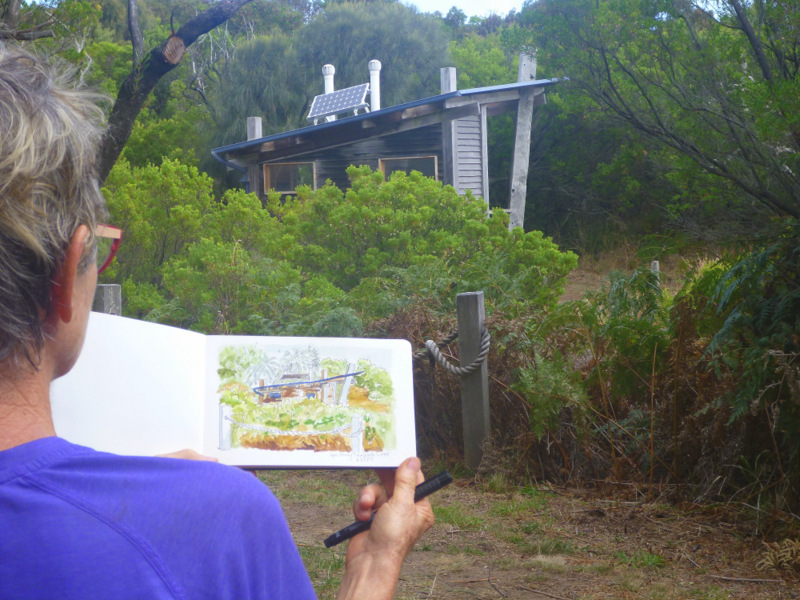 A grassy site next to the inlet and no neighbours within 50m made it very attractive. 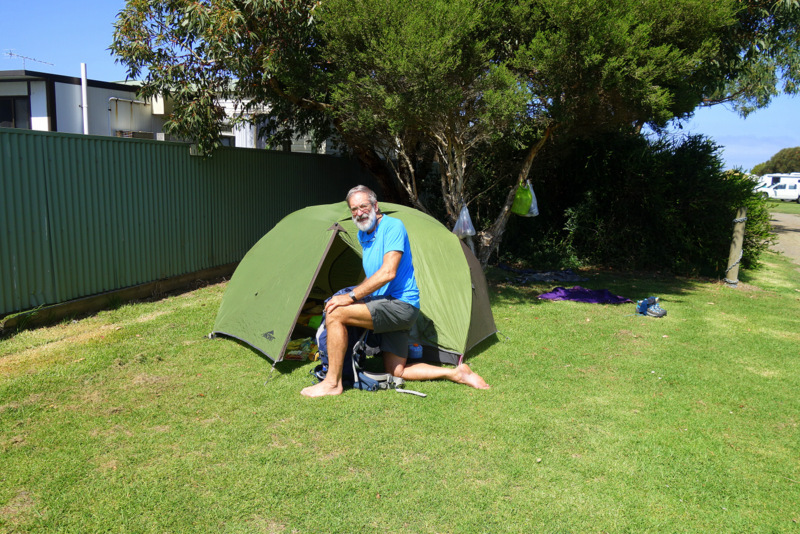 A camp of year 9 students from Kings College was a worry, as they are probably on our path tomorrow, but so far they seem ok.
Day 1, Sat March 4th, Apollo Bay to Elliot Ridge, 10 km. 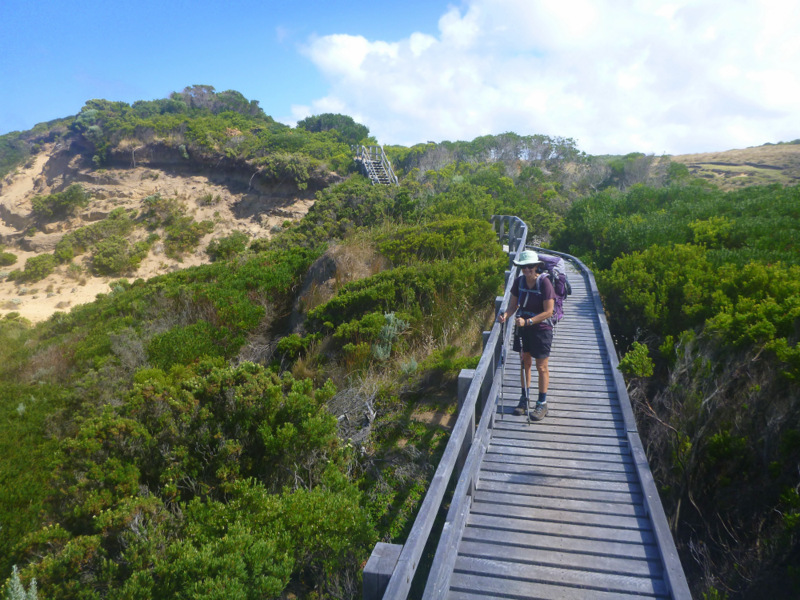 The path follows the main road to Marengo Caravan Park where it heads along the coast above the rock platform. This is the holiday house coast, with the hills above us lined with them, and the track passing invisibly within 50m of several. 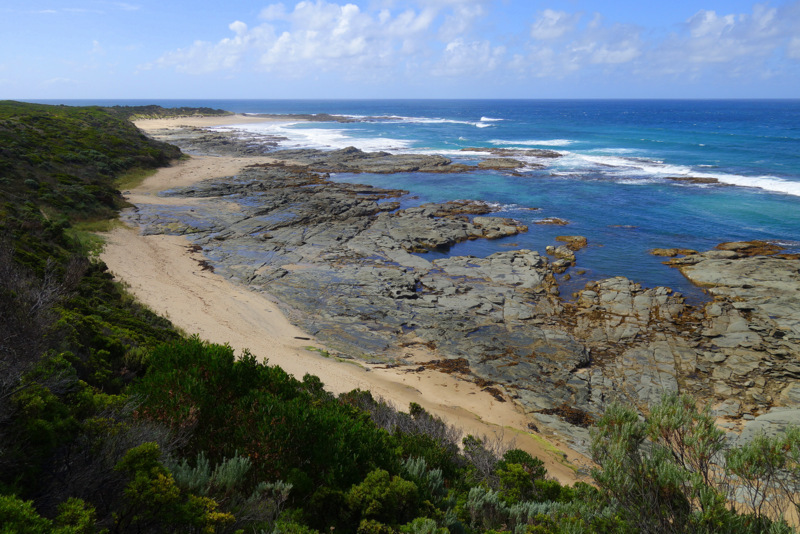 The track drops onto the rock platform for several hundred metres, and is very slippery with kelp fronds. The rest is very well benched into the hillside, with steeper climbs stepped with rock or hardwood corduroy. The timber slats are 150mm wide but alternate with 100mm and 50mm thick planks, which give good traction when wet, but are too uneven for comfortable walking. None of the climbs are difficult, with heel on ground climbing mostly possible. Elliot Ridge is in tall Manna Gum forest, mature trees but nothing very thick, so I would guess 50-60 years old. Koala poo was regularly spaced along the track, but we only managed to spot one near the camp. He made his presence heard in the morning, chorusing the dawn, letting everyone know that this was his ridge. Big male koala, and a noisy one. 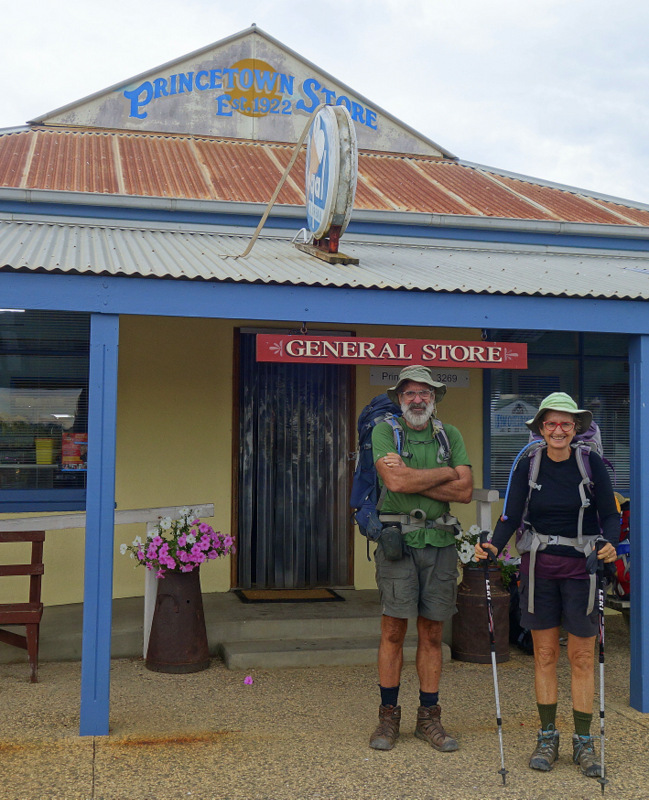 We were impressed by a party of three hikers carrying packs as well as two babies in harnesses, but they were heading on to Blanket Bay and a support vehicle, so doing around 20 km as a day walk. The campsites are all strung out near the ridge crest, around 20 metres apart and they are all cut into the hillside for level camping. Sadly they are quite dirty, with no grass surviving on the sites, and lots of fine dust. They would be much worse when wet. Day 2, Sun March 5th, 12 km to Blanket Bay. 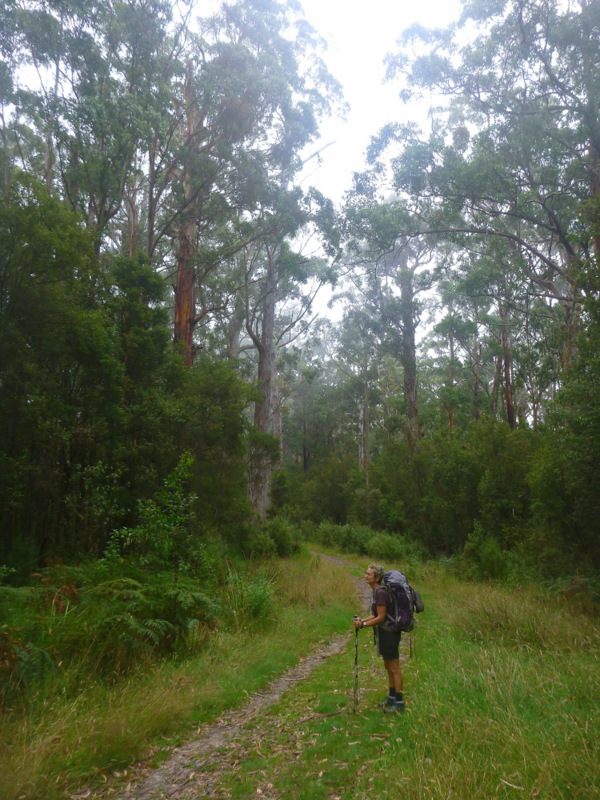 A cool and overcast day made for very pleasant hiking along old 4wd tracks mostly in the wet gum forest but with a few bands of stunted stringy-bark, again with koalas. A dead swamp wallaby on the track had us wondering about speeding National Park maintenance vehicles, but I couldn’t see how it had died. 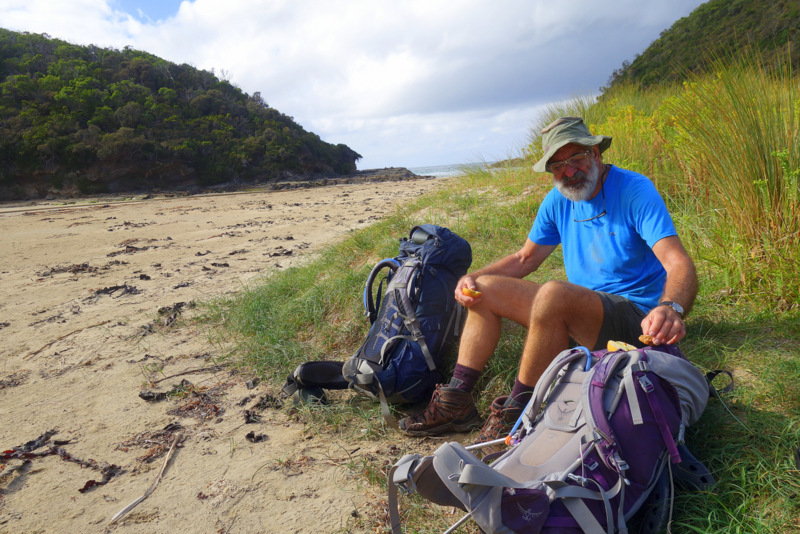 It’s all easy strolling, with a longish descent to Blanket Bay, so our feet are feeling a bit pounded by the time we reach the bottom. 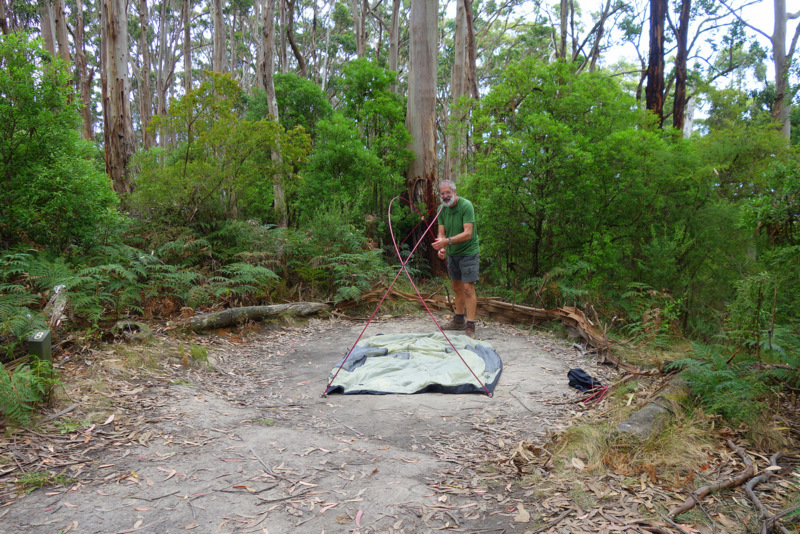 The hiker camp is only about 10 metres from the road but there was very little traffic. There were very few car campers staying here and only three other hikers, so we don’t feel crowded. 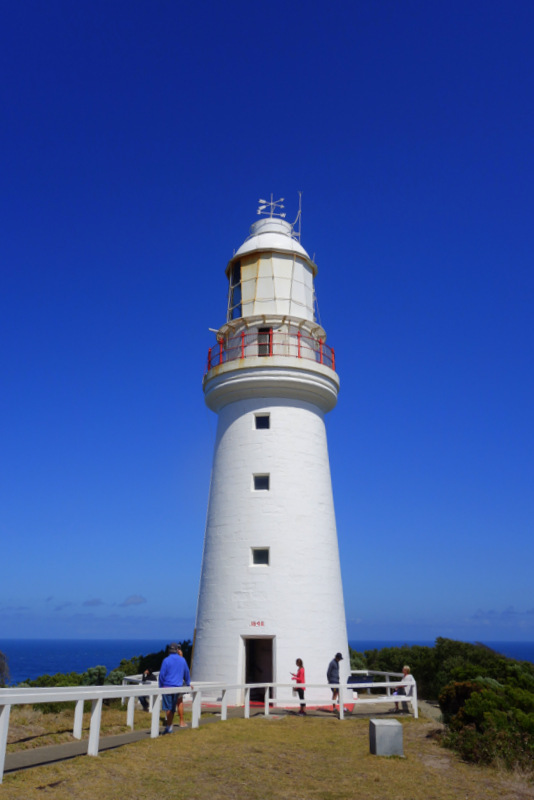 Day 3, Monday March 6th, 11 km to Cape Otway. 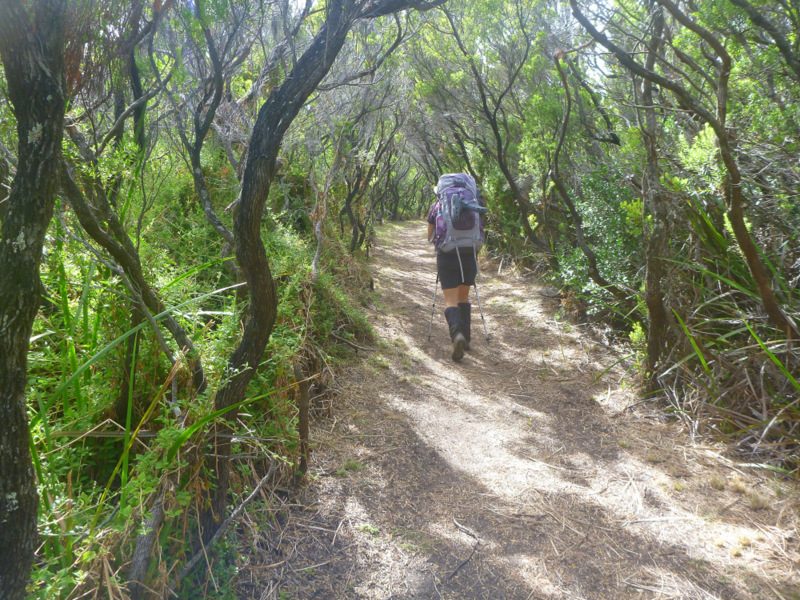 More open stringy-bark woodland for 5 km to Parker Inlet. 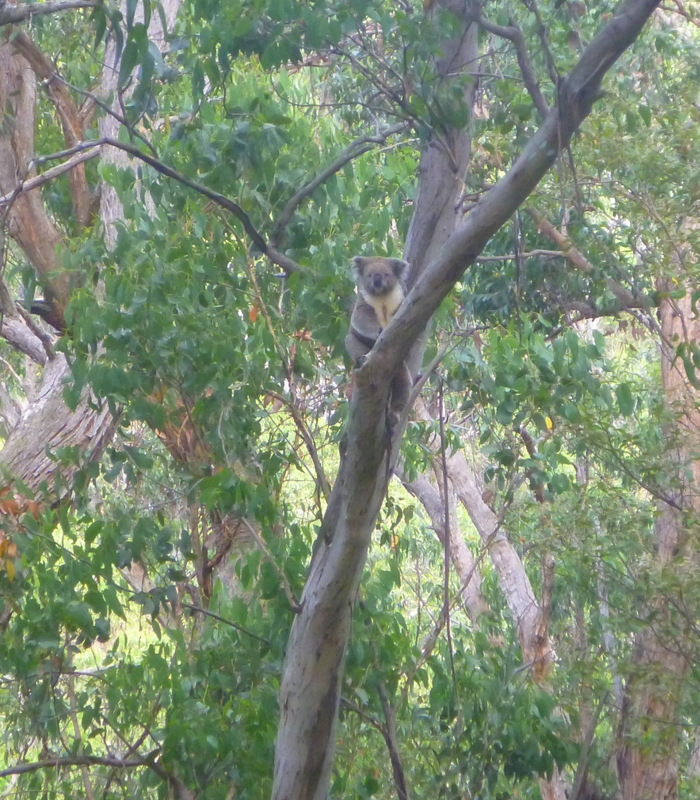 The canopy is only at about 10 metres, so koala spotting is relatively easy and they are at a good distance for pics. There are very few views along the way, with the track beginning to feel enclosed as a green tunnel. This could be a good thing in bad weather, as the track is sheltered, but the lack of a view begins to pall after a while. 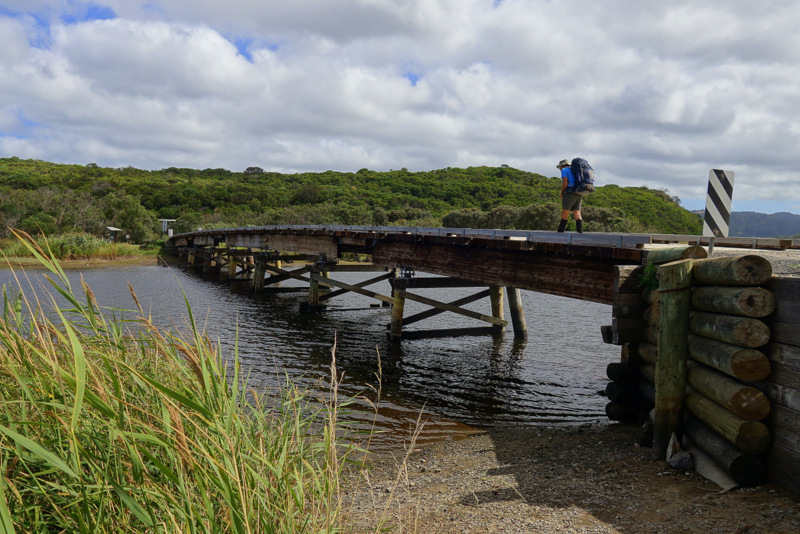 The track climbs steeply from Parker Inlet up what used to be a winched tramway for supplies landed here for the Cape Otway Station. Now it’s only a staircase and we have to power ourselves up it before another 3 km of green tunnel through melaleuca and banksia woodland. Sadly a prison like holiday house has been built right on the top near the track, dominating our view for some time before we finally get past it and the lighthouse appears. There is a restaurant inside the Cape Otway Station, and our stomachs are rumbling at the thought of fresh food. The place has hundreds of people coming and going to check out the light and associated buildings. Hikers have a half price entry fee and they are happy to hold our packs while we head in for the food. Spicy fried fish and salad with cider for $67 plus the entry of $20, so it’s an expensive lunch but we’re soft and need the boost, (and this is only day 3). 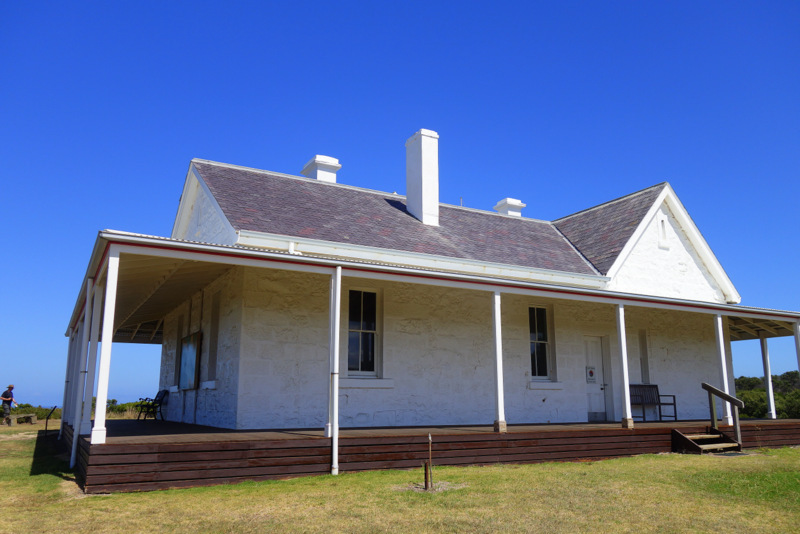 The campsite is tucked away in dunes about 600 metres from the station and 50 metres from the station cemetery which appears to have been rescued from dune sand flow. A hollow rock has been placed beneath the water tap to catch runoff, and the birdlife utilising the water is wonderful to watch. Full on war between the thorn-bills and honey-eaters. 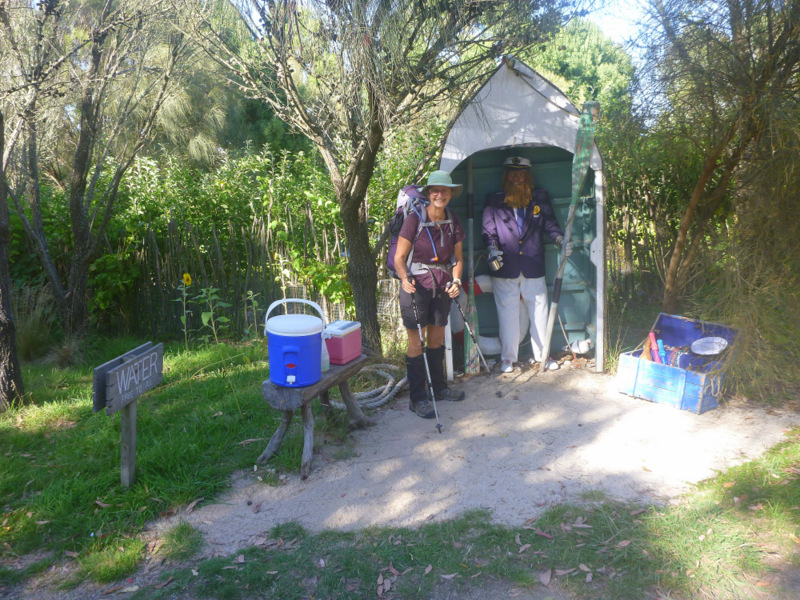 Day 4, Tue March 7th 10 km to Aire River. 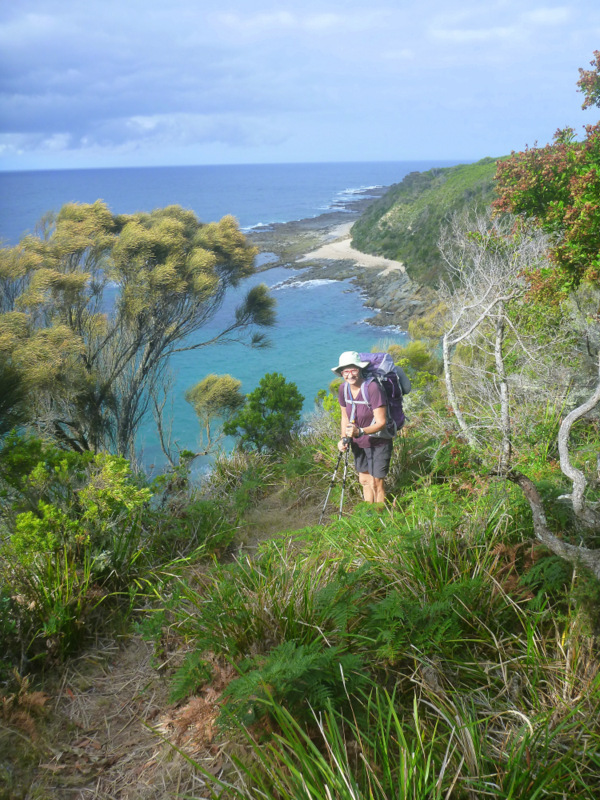 It’s four km of walking along the green tunnel of melaleuca/ banksia until the clifftops above Station Beach and the first view. We drop to the beach as the track is quite soft and sandy and we guess that the beach can’t be any worse. 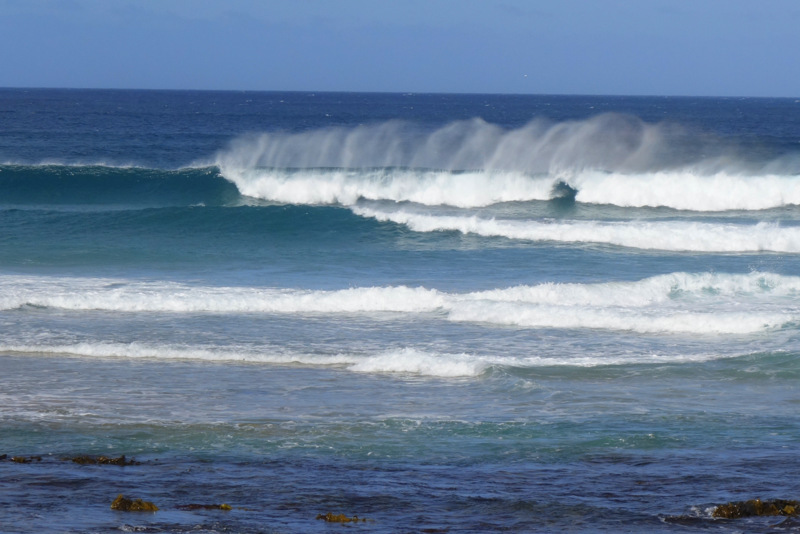 There is a strong wind blowing spray off the top off the waves and stinging sand into the back of our legs. We walk the tide line to stay on hard packed sand, but we have to stay alert and run often to avoid a wetting as the waves are not consistent. Station Beach in a strong wind. Back into the green tunnel after 2 km of beach walking, then onto a viewpoint from an escarpment looking down onto the Aire River bridge and the cliffs along the inlet. The track deteriorates again to fine soft sand down to the bridge, making for a hard slog, but at least it’s mostly downhill. The hiker’s camp is set high on a hillside above the car camp sites, but we have to go down every time we want to use the toilet. There are signs telling us that we should be getting our water there as well, but the tank at our level seems half full so we use that supply instead. Pepperoni at lunch seems to have upset my stomach, so by late afternoon I am vomiting, with diarrhoea coming on towards evening. Day 5, Wed March 8th 12 km to Johanna Beach. Fortunately for me, today is a relatively easy day of strolling along the clifftops, but set back into the scrub and emerging for several good viewpoints. The woodland is stringy-bark again, but with an understory of grass tree which look fresh and clean. Lots of phytophera in this area so we have to scrub boots several times. 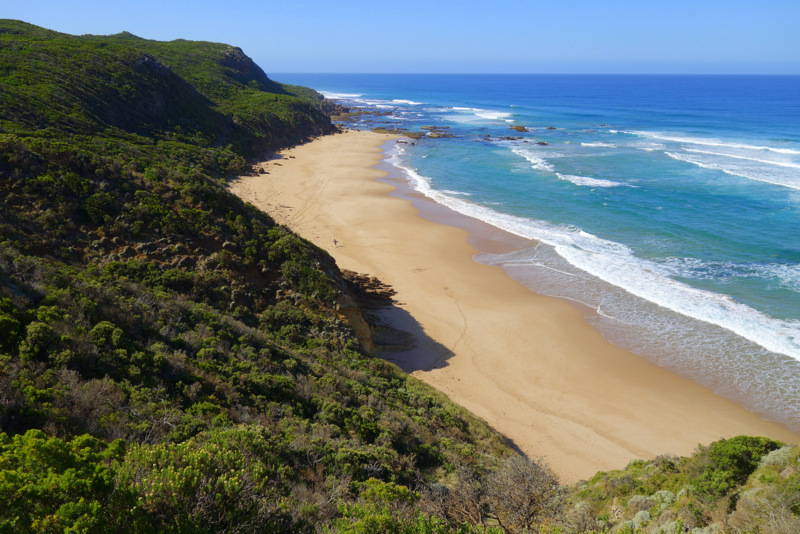 We finally drop steeply to Johanna Beach and another 2 km of soft sand and dodging waves before the carpark and the final killer climb for the day. 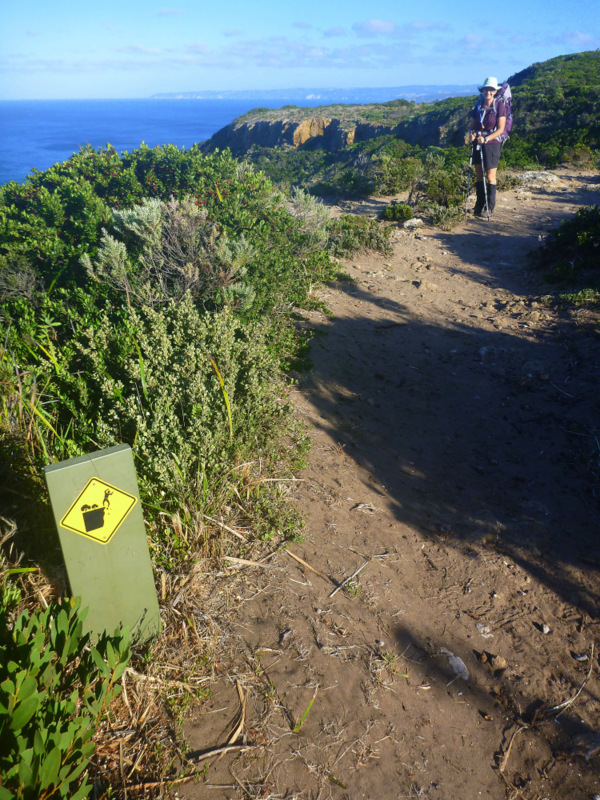 It feels like 800 metres but it is really half that on a steady uphill grade to a terraced ridge-crest camp overlooking Johanna Beach. This is the most spectacular of all the campsites, and hikers have appeared it seems from nowhere to share it. We arrive early and manage to score the best site, but a dozen boys from Silesian College with two outdoor ed staff take over the group area, and another couple from WA also settle in. Two other Melbourne women are also walking on our timetable, but they have disappeared, we assume to a B&B, but they have settled on the beach below to have a swim. There is a band of thick cloud on the south horizon, which moves in on us during the afternoon. The bushfire smell is unmistakable, so there’s a bit of a flutter around the camp wondering where is the fire. We are given a spectacular sunset through the smoke. I go to sleep for the afternoon and manage to recover a bit from the food poisoning. Day 6, Thur March 9th 14 km to Ryans Den. This is the day that makes this walk one of the Not So Great walks. 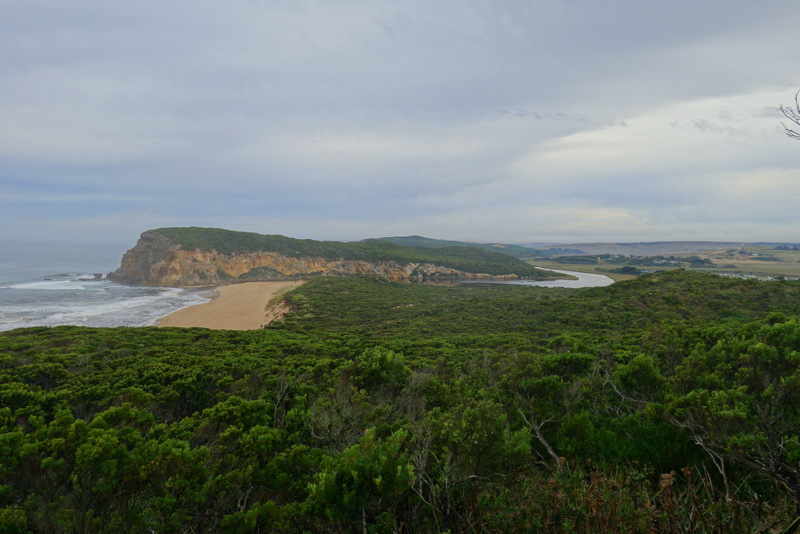 There is a steady climb from Johanna Beach through farmland onto a public road. We forgot to refill our water bladders before leaving Johanna, so we are running short near the top. A house owner is practising his golf strokes and is happy for us to refill at his tap. 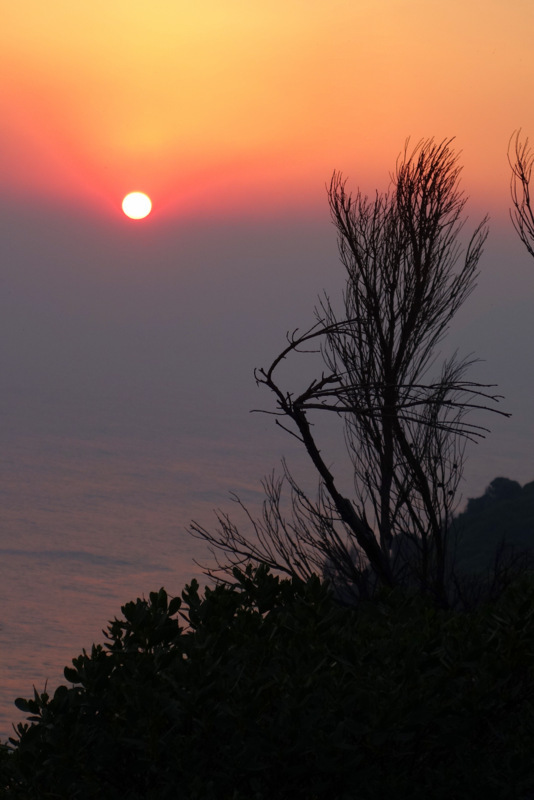 He also lets us know that the smoke last night is from a controlled burn east of us at Wye River. Another km down the road and there is a trail angel household with free water and jams for sale. A mannequin is actually wearing a sailor suit and a trail angel badge. Someone has been in the USA. Eight kms of road-bash along the ridges before a steep descent to Milesia Beach on a management track. 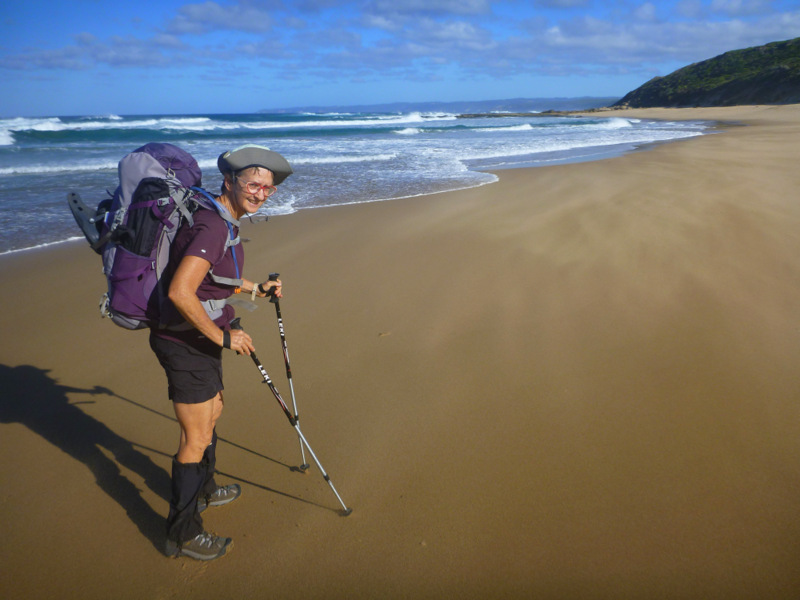 If we had to do this walk again, (and I can’t imagine why), then I would arrange for a B&B pickup at Johanna Beach with a resupply and delivery next day to Milesia Beach to start walking again. It is a rough and broken stretch of coast, and would be a challenge to install a path, but that’s what is needed to bypass the roads. Milesia Beach is probably the best one for us as there were sheltered spots and rock pools where we could dip without the crashing waves. Mind you, the water is still too bloody cold, so knee deep was as far as the dip went. 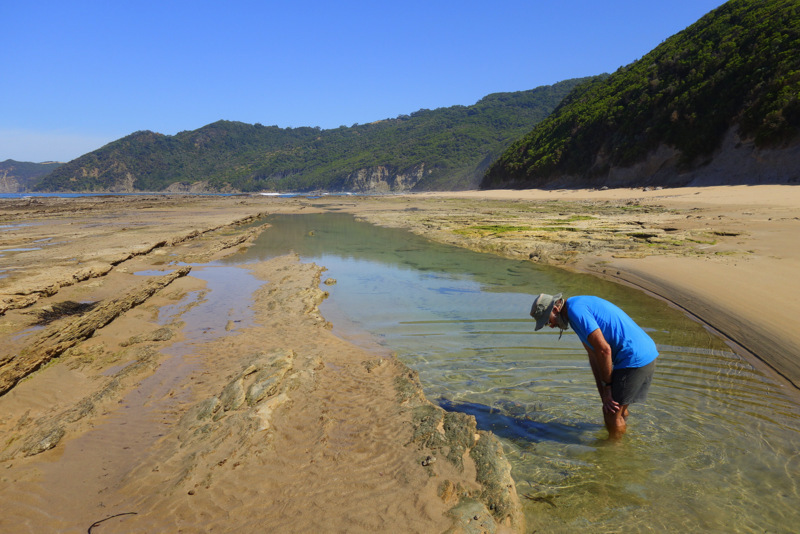 We walked the beach and found the exit back to the inland track had not been maintained for many years. The steps were buried in sand and the scrub growing out from the dune half covered the timber. We had to push our way up through the overgrowth. 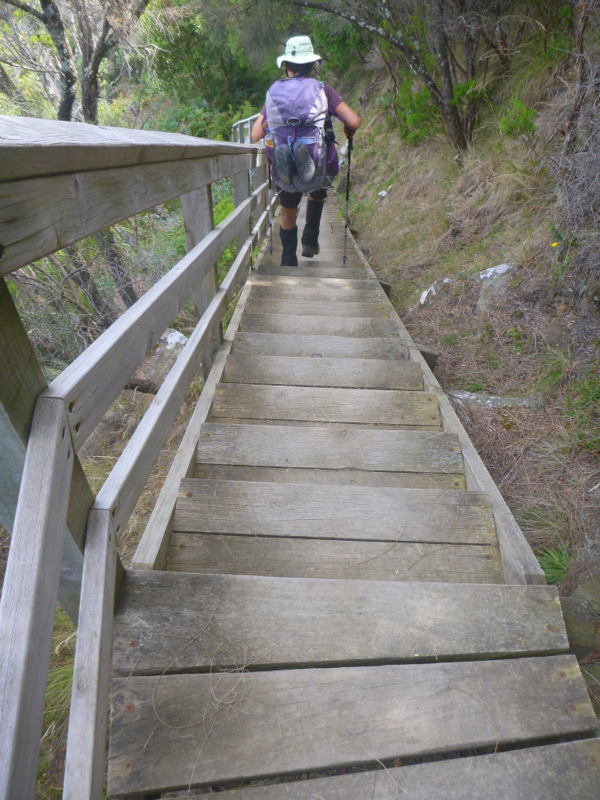 The coast on the section is also deeply dissected and erosion prone, so the track had many steep stairways and boardwalks before culminating in a spectacular timber staircase to bypass an avalanche zone. We begin to understand why the track isn’t all along the cliff-line. 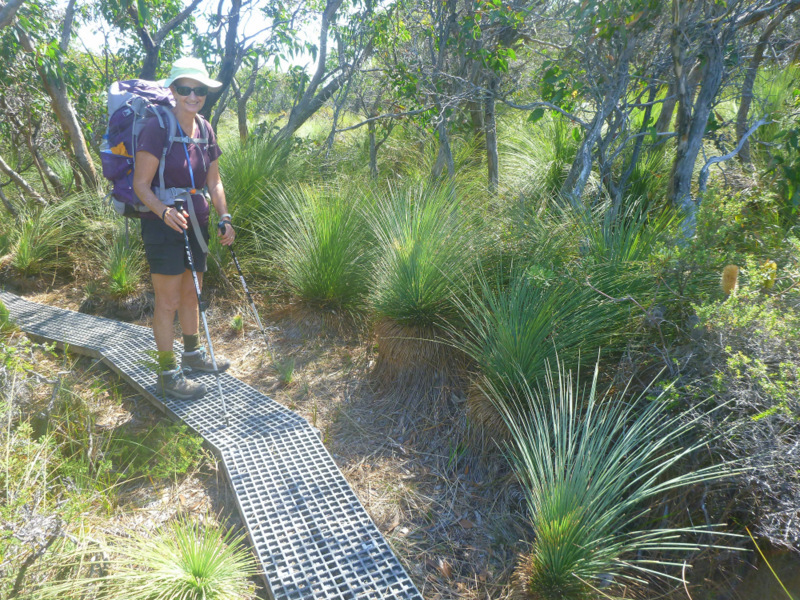 Ryans Den was sited again along a ridge-crest with camps dug into the hill-sides and surrounded by stunted gum forest. 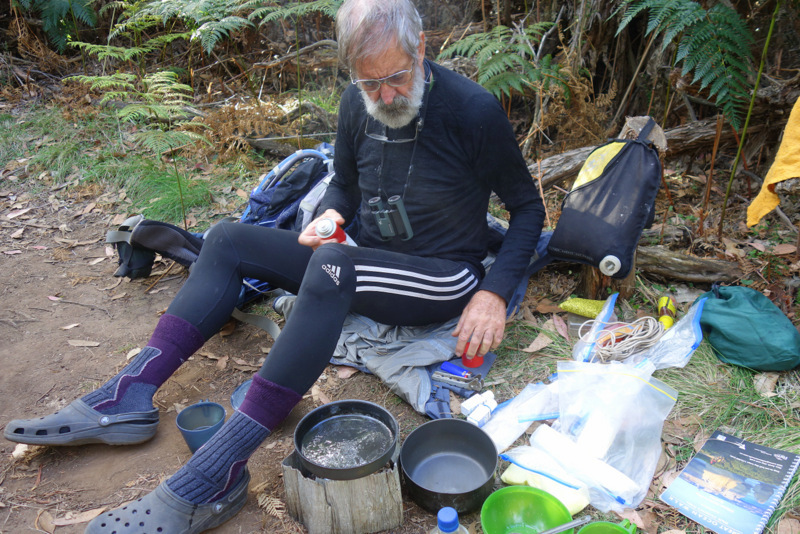 Day 7, Fri March 10th 13 km to Devils Kitchen. It’s a sweaty day for walking with high humidity and a heavy overcast. There are lots of deep gullies taking us up and down to make hard work of the first 4 km to Parker Rd. We follow the road for 500 m or so on a grassy path before a turnoff takes us down following a creek into some of the prettiest forest walking we’d seen so far. The track looked like an old packhorse trail, being well graded and wide. The carparks for Wreck Beach and The Gables were easily recognised on approach by the piles of tissues left in the scrub. Devils Kitchen toilet on the cliff top. Not exactly subtle placement. 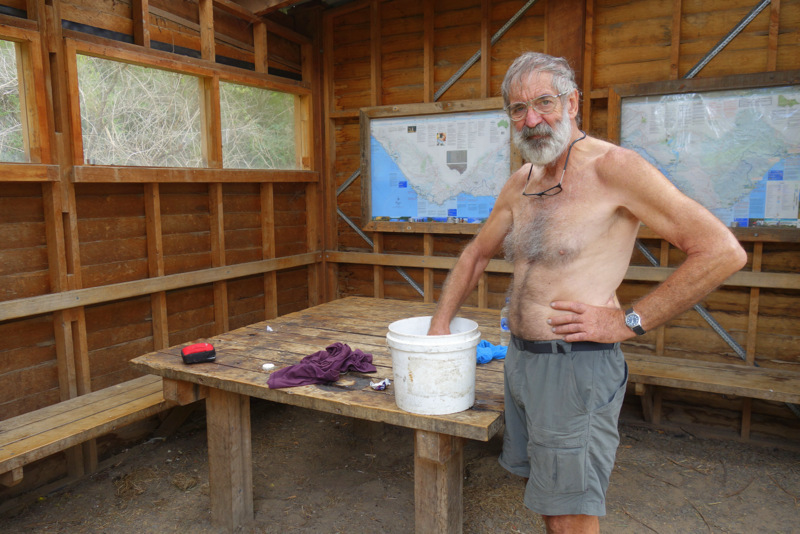 There are several foot baths for Phytophera and about a kilometre of boardwalk before we roll into the Devils Kitchen campsite. 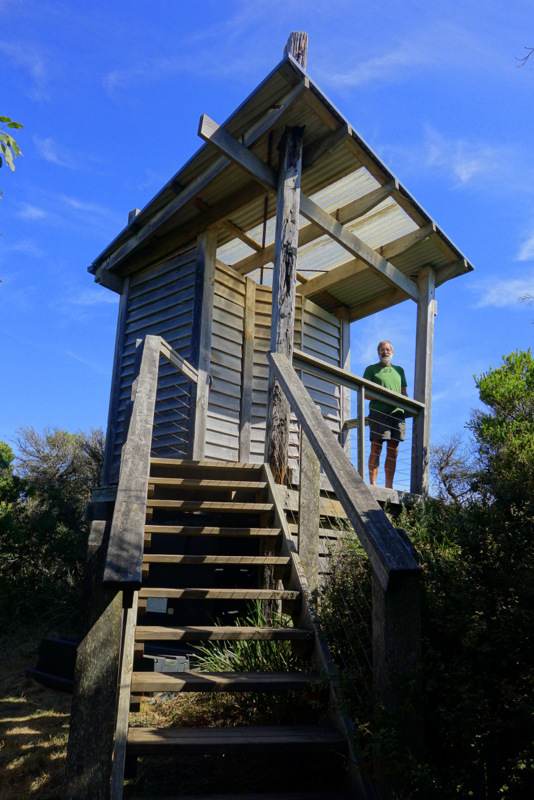 This is a cliff-line camp, but only one site and the toilet are poised on the top. They are both facing west into the setting sun and are too hot for a pleasant afternoon, so we settle into a well shaded site below. We celebrate our last night with pancakes and honey. 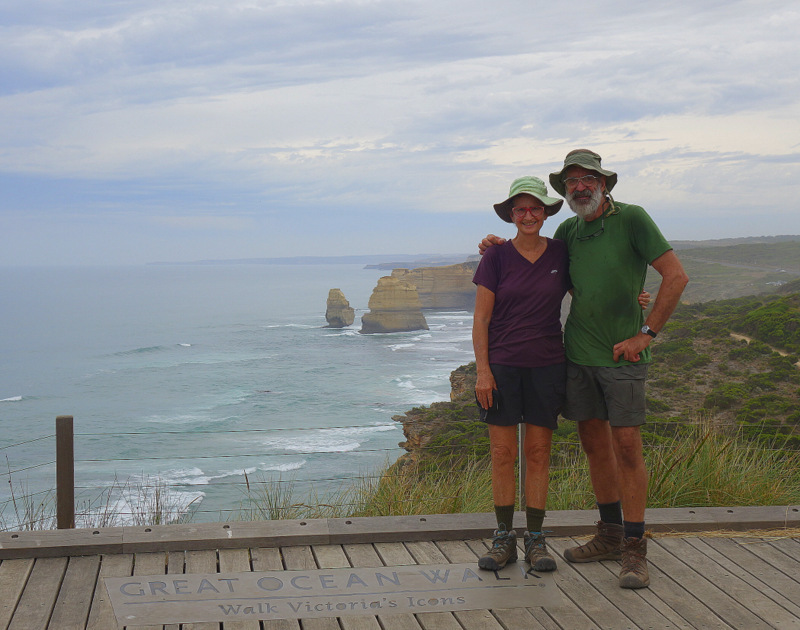 Day 8, Sat March 11th 16kms to Twelve Apostles and finish. It’s easy strolling now, taking 2 hours for the seven km into Princetown and its shop. Alison gets stuck into her milkshake and cheese toastie, while I settle for a coke. Princetown has been a popular camping area for well over a hundred years, and you can see why with the peace emanating from the wetlands around it. The recreation reserve is packed, with campers, caravans and wicked vans all higgledy-piggledy. 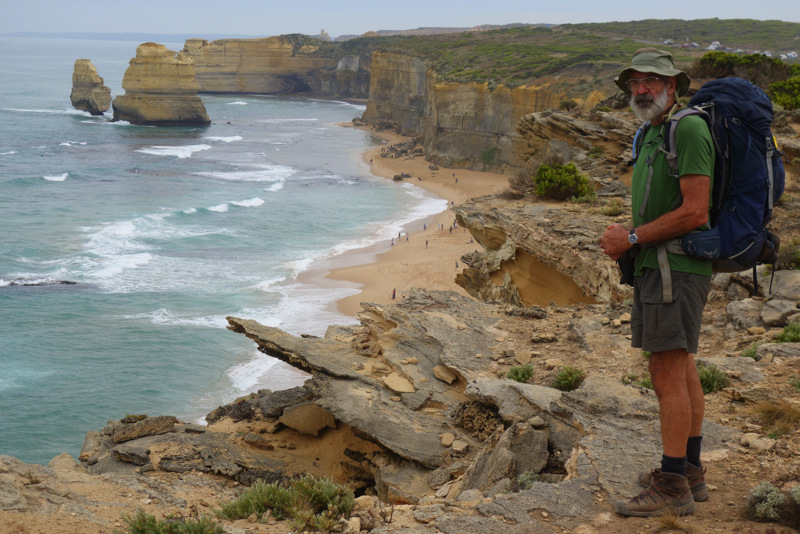 The Twelve Apostles are another 2 hours through high scrub, with a viewpoint poised on a crest for us to sneer at the tourists. And there are hordes of them, with the Apostles apparently making it onto the Victorian top 5 must see items. There are cars and buses everywhere, with about 20 in the carpark and 20 out on the roadside. We make it unmolested through the carpark and under the road for the final 800 m drag up to the visitor centre, where most of the traffic is concentrated. We buy our ice-creams and sodas and settle down to wait for our pickup. I have barely opened my ice-cream before Alison’s brother emerges from the carpark and we are loaded for the trip home. 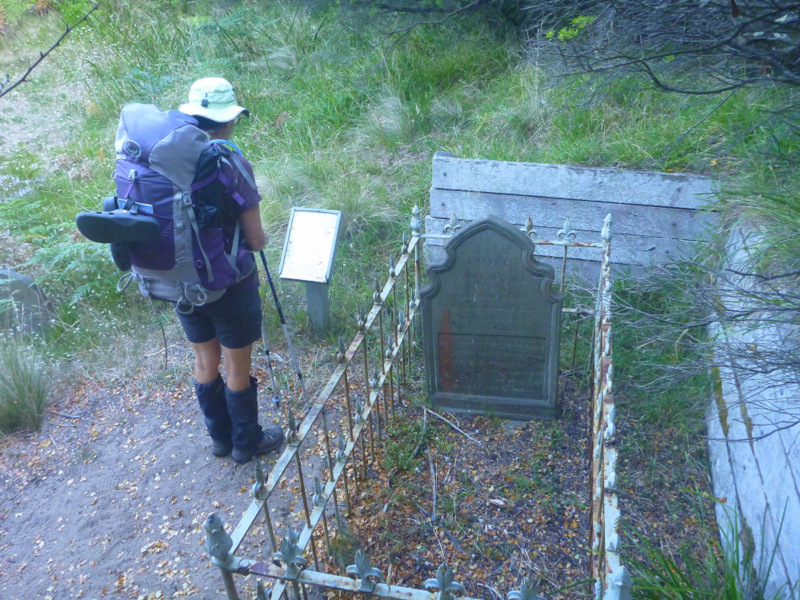 Looking back, this is really only a 4 day walk for experienced and fit walkers. There have been huge sums of money spent to build the shelters, toilets and campsites to make it accessible to any one, and I guess that’s what makes it a great walk, rather than spectacular scenery or isolation or whatever else pushes your buttons. We were fortunate with mild weather, but I can imagine what this area could do with a southerly buster setting in and rain out of the Antarctic, and much of the trail has been built to provide shelter from those conditions. I am glad that we took the full 8 days, giving us the time to sit back and enjoy the camp areas every afternoon, but next time I’ll make sure that I have a Kobo or Kindle along as well.